Well, if ninjas succeeded in stealing the secret information of their enemies, after that ninjas have to bring it to their home. It goes without saying, there existed no telegraph, email, and telephone at that time. In addition to that, it can be imagined that there were many cases where the distance between their duty stations and their home town was so far. So how did ninjas do it? In fact, ninjas invented some ways to overcome the long distance carrying information. They were called " Dentatsu-Jutsu (伝達術) " . We are going to learn about them. The base of Dentasu-Jutsu is to send signals to companions. Needless to say, in this case, ninjas had to change information which only their group could understand using signals in advance. Ninjas transmitted information using signs to their members. So, what kind of methods did ninjas use? Firstly, they utilized tools, which appealed to the sight and hearing. For instance, in battles ninjas used drums and bells. Those tools let out low tones, which make enough sound to reach the ears of their comrades even in a noisy location. On the other hand, in naval battles gongs of ships were used. As explained many times, ninjas often disguised themselves as " Yamabushi (山伏) " who were mountain priests, ninjas would blow on a conch when disguised as one. They used to believe that blowing a conch while they were walking on a winding path on a mountain was a special talisman. Of course, ninjas converted the meaning of the information into something relevant to them. Or else, like the description in the article of " Goshiki-Mai (五色米) ", ninjas made use of five colored rice and branches or knots of ropes. With combinations of these tools, ninjas could express a lot of information. Ninjas transmitted the secret information to their companions by means of showing them complex Goshiki-Mai, branches, and knots. In the case of multiple ninjas working together to transmit important information to faraway places, ninjas frequently used the semaphore. Of course on such occasions, it was during the daytime when ninjas could see the flags which other ninja had. This method was called " Mekiki-no-Koto (目利きの事) " . First of all, one Ninja climbed to the top of a hill and he sent messages to other ninjas who stood on the top of a different hill with two flags, one in each hand. Next, the second ninja, who received the information from the first ninja, transferred the code to a third ninja in the same way and the third ninja to the fourth Ninja and so on until it reached its destination. In this way, secret information was sent as far as the number of ninjas would allow. In the case when Ninjas use this ninjutsu (忍術), the most important thing was to work out the suitable physical locations on which they would stand. The merit of this method was that a lot of information could be reported with certain combinations of the two flags and certain movements of the sender. This was the same as Morse signal today. Maybe more than one hundred different meanings could be transmitted. As long as ninjas made use of this method, both the sender and receiver of the information could exchange their message with each other. Although certainly ninjas had an amazing running ability, they could deliver important information to their home much faster under this method than simply by running there. This fact proves that the code of the ninja demanded cooperation above all rather than outstanding individual ability. It’s worth mentioning that this method was used for sending information about rice markets during the Edo-period. It may have depended upon the influence of ninjas. The beacon " Noroshi "
Of course the semaphore was a method usable only in daytime. In the night, mountainous areas are covered with darkness and even ninjas cannot see flags then. Well then, how did ninjas transmit secret information then? They used firearms like "gando (龕灯) " which acted as a kind of flashlight. Ninjas were specialists with fire and utilizing firearms was one of their specialities. It is amazing that ninjas used a kind of morse code signaling for sending information using light. In addition to this, ninjas made use of beacons. In Japanese, a beacon is called " noroshi (狼煙) " . Noroshi means the " smoke of wolves ". The reason is that, when making noroshi, the feces of Japanese wolves was used as fuel. 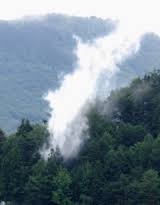 The characteristic of the feces of Japanese wolves as fuel was that when they burn, the smoke goes straight up. In the daytime and evening in those days, a lot of smoke billowed out from private houses from cooking and heating. Almost all of it flowed out on a sideways angle so the smoke which arose from burning feces of Japanese wolves was very useful for making signals because it soared up vertically. The effective range of Noroshi is 40-80 Km . This is much longer than that of the semaphore. However, compared to the semaphore, the weak points of Noroshi was that a lot of information couldn’t be transmitted and the signal was always one-way traffic. Unfortunately, wolves in Japan are now extinct so the perfect noroshi can now no longer be made. The beacon " Noroshi （狼煙) "
The tally " Warifu "
Even if Ninjas succeeded in stealing secret information from their enemy, it was not enough until the information exchange was completed. The true finish was when their relay anchor arrived at their lord. However, a potential problem may have still remained. There was always a possibility that ninjas interchanged information with hostile ninjas in their information exchange. It was so often the case in the Warring States period that lords called " Daimyo (大名) " gave fake information to their hostile Daimyos on purpose. On occasion, ninjas under the lord had already been killed and another ninjas passed themselves off as the killed ninja and gave off a false signal. Accordingly, identity verification was indispensable for ninjas. There were some specific methods used and they are described in the famous article " Ninja's secret words ". I am going to introduce one more method that ninjas used to confirm identification called " Warifu (割符) ". Warifu was a small wood board cut in two equal parts. On the surface of a Warifu piece, a certain specific character was written in advance before it was separated. Each ninja had a piece of warifu with them, when they met each other, half of a warifu was demanded. When the warifu half was put together with the other to produce a complete character with the same wood and writing match, then confirmation of the ninja’s identification was accepted. 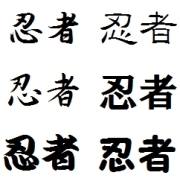 This was a very simple way of confirming identity and was so effective that not only was it used in Japan but we can also find it in China and Europe throughout history. 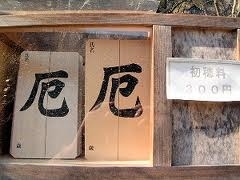 The tally " Warifu （割符) "